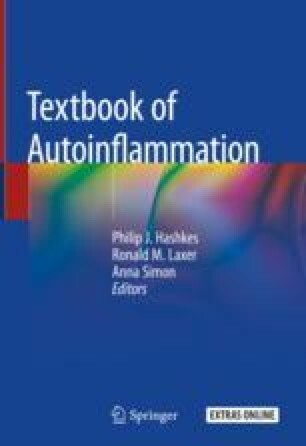 This chapter focuses on monogenic autoinflammatory disorders that affect bone. The presence of sterile bone inflammation may be accompanied by inflammation of the skin and intestinal tract. The pathophysiology varies by syndrome and includes dysregulation of the IL-1 pathway or aberrant intracellular signaling defects leading to activation of innate immune cells including osteoclasts. These are rare disorders with variable outcomes. IL-1 inhibitors have been used successfully to decrease inflammation in Majeed syndrome, deficiency of the interleukin receptor antagonist and for non-osseous manifestations of neonatal onset multisystem inflammatory disease. For other disorders such as cherubism, treatment remains challenging. Recognition of additional monogenic autoinflammatory is likely as this is a very new field of investigation.